How big is your sausage? Inbound tourism from SARS high-risk countries to stop? The head of Chiang Mai Public Relations Office, Wichien Noonrowd, has called upon Chiang Mai people, drivers, motorists and tourists to be careful while they celebrate the Songkran Festival. The statistics from the Provincial Accident Protection Committee showed that there were 3,342 accidents, with 1,607 vehicle accidents resulting in 17 deaths. Most of them were caused by collisions between cars and motorcycles. During last year’s Songkran festival, the highest numbers of accidents occurred on the 14th of April during the afternoon and running through to the evening. Wichien said that more than 80 percent of injured people rode carelessly without helmets and were under the influence of alcohol. He appealed for residents and tourists to be careful and to drive with safety and never drive while drunk. It is hoped that the number of injuries and accidents will be less this year. With the high percentage of unlicensed drivers and riders with no helmets, Chiang Mai will be indeed fortunate if this is the case. Chiang Mai Tourist Police have made special preparations covering all tourist services and guarantee public safety during this year’s Songkran Festival. The operation will cover Chiang Mai, Lamphun, and Lampang. Pol. Maj. Archayon Kraithong, Chiang Mai Tourist Police inspector, said that the Songkran Festival holidays always attract a large number of tourists to the Northern provinces, especially Chiang Mai, Lampang and Lamphun. “Chiang Mai Tourist Police are now ready to serve tourists during the peak season by setting a strategy for the tourists’ facilities and for their safety. Police numbers will be increased in tourist crowded areas such as Chiang Mai Arcade Bus Station, Chiang Mai International Airport, Chiang Mai Railway Station, Night Bazaar, and any tourist sites,” said Pol. Maj. Archayon. Special operations teams will be prepared to investigate criminal cases and suspects around hotels and guesthouses. They will also be stationed with the Chiang Mai Land Transport Office to check vehicle users and for drugs at the Arcade Bus Station. Due to Iraq war tensions police will be vigilant for signs of criminal or terrorist activity around embassies and consulates to prevent any such incidents in advance. The Chiang Mai Tourist Police specialist Songkran Festival operation officially started from the Tourist Police Office at 6 p.m. Thursday (April 10). Chiang Mai Municipality and the Art On The Ground Club have organized Happy Lanna New Year Celebrations April 9-15 at Mahawan Temple grounds on Thapae Road, Chiang Mai. The activities include traditional ceremonies, such as building sand pagodas, paying homage to Buddha images, making merit and presenting Pha Pa (yellow robes given to the Buddhist monks) at the temple, plus painting, carving, pottery and hand woven cotton. There will also be folk performances with local Thai instrumental bands, a local food marketplace and herbal medication will be available at the temple. Chao Duangduen Na Chiang Mai, the director of Chiang Mai Cultural Council, Udom Puasakul, deputy Chiang Mai governor, Udornphant Chantarawiroj, president of Chiang Mai Provincial Administrative Organization, Boonlert Buranupakorn, Chiang Mai mayor, Chalermsak Suranant, director of Tourism Authority of Thailand, Region 1 Office and Pornchai Jitnavasathien, Municipal Councilor of Chiang Mai Municipality presided over the opening ceremony on April 9. A Phayao tour company has signed a contract with another in Laos to open a new travel route linking Phayao to Chaiyaburi District in Laos. Ruengwan Buanuch, Phayao deputy governor, presided over the signing ceremony between Kwan Phayao Tour and Service Limited and Sai Nam Rung Karn Tingtiew Limited from Laos. These two companies will open a new travel route from Phayao to Chaiyaburi District to promote a tourism linkage between Phayao and Laos. The new route is also aimed to promote eco-tourism, arts and culture of both Thailand and Laos, and strengthen relationships between the two countries. On 10th and 30th of each month there will be local products marketplaces at the Thai-Laos border in Phu Sang Sub-district as an additional attraction for tourists. The “For Fan Fun Fair” tour concert was held in Chiang Mai at the Municipal Stadium on March 30, with guests Nat, Kat and Jintara, the girls featuring in Thongchai “Bird” McIntyre’s latest album. Bird Thongchai McIntyre (center), Nat Meria (right), and Kat Catereeya (left), last week met their Chiang Mai fans. On the previous day, Bird, Kat and Nat met fans and the media at the Imperial Mae Ping Hotel. Bird was looking forward to being on stage for the Chiang Mai fans, as his last concert in Chiang Mai, Baab Bird Bird, was several years ago. The concert started about 7.30 with his famous song Fan Jah featuring Nat, Kat and Jintara. The show was quite special for Chiang Mai fans because Bird sang many special famous northern Lanna songs from the past and spoke in the Lanna language as much as he could. Following the sell-out concert, there were traffic jams, with many concert goers taking over 30 minutes just to exit the car parks. Before coming to Chiang Mai, Bird concerts were held in Khon Kaen, Phitsanulok, Nakhon Sawan and Chiang Rai. Following the Chiang Mai concert the group is traveling to Surat Thani and Phuket, and will end the tour with a concert in Hat Yai. Thai and foreign couples can be married in traditional Lanna style at the Northern Thai Traditional Wedding Ceremony, on May 11. The ceremony will be hosted by the Chiang Mai Public Health Office and the Chiang Mai Cultural Council. One of the objectives of the arranged weddings is to prepare the couples physically, mentally and socially for their change of status, as well as to maintain Lanna traditions, especially with regard to the sartorial aspect, which is regaining popularity in the North and elsewhere. This traditional ceremony called “Ku Kaew Wattanatham Muang”, or getting married in the Northern style, is open for both Thai and foreign couples who can fulfill certain requirements. Thai couples should be at least 20 years old, have photocopies of identity documents and pay a fee of 8,900 baht for registration. They will receive health check-ups and be provided with information about family planning and maintenance; be hosted at a wedding reception, joined by up to four guests, lunch in the Lanna Khan Toke style and receive a photographic record of the ceremonies along with souvenirs and presents. Foreign couples are required to pay $US700 (which works out to over 30,000 baht). They also need to be 20 or over. They must offer their passports as registration documents. They will be invited to wear a Lanna wedding costume, and the ladies will be provided with make-up and hairdressing services. We were not informed what happens if a foreigner wishes to marry a Thai. Interested couples could contact the Chiang Mai Provincial Public Health Office; 053 211 048 ext. 141 and 053 211 740 or [email protected] before April 20 this year. Priority is accorded to the earlier applicants. A very large Nam Pa Yon (Chiang Mai’s famous fermented sausage) has been made by the Chiang Mai Provincial Red Cross, with the help of the Chiang Mai Municipality, the Tourism Authority of Thailand in Chiang Mai, the National Genetic Engineering and Bio Technology Center, V Food Co. Ltd., the Alumni of Yupparat College and Mae Jo University. Assistant Prof. Arkorn Kanjanaprachot, vice president of administration at Mae Jo University, created the bio-fermented sausage project for the north’s New Year Songkran celebration. The sausage, which weighs in at a whopping 2.5 metric tonnes, is for sale at 50 baht per kilogram from April 12, with all the proceeds from the sausage sales being given to the Provincial Red Cross. It has been designed to promote traditional northern Thai culture through northern food and the bio-fermented sausage is better than other ways because the production is disease free and safe for consumers. The Chiang Mai Cultural Council has joined with the provincial government and private organizations to organize an international food festival on Rajadamnoen Road during Songkran this year, April 12-15. The festival is to promote Chiang Mai’s cultures and traditions as well as tourism attractions. The highlight this year is that all participants, including the tourists, have to wear Northern style clothes to become involved with the spirit of the traditional festival and experience the atmosphere of old Chiang Mai. This part of the Songkran celebration will run from 3 p.m. until midnight with many activities, including Lanna style performances, folk dances and local drum playing. One Tambon - One Product stalls are also provided with the local handicrafts and local industrial goods. The Chiang Mai Restaurants Club is providing a variety of foods, both northern and international, supplied by more than 50 Chiang Mai restaurants. The roadside temples are participating in the fair by holding traditional activities such as the bathing and respecting of Buddha images and exploring the Wat’s local style architecture at Wat Pan On, Wat Muen Lan, and Wat Sam Pao. During the festivities, both Thai and foreign visitors will be entered in the local costume contest. Winners of the most beautiful northern style costume will receive plane tickets, silk textiles, silverware, leather, enamel, and other prizes. The opening ceremony will be held at 5.30 p.m. on the first day, presided over by Chiang Mai Governor Pisit Khetphasook. The Great Silver Bowl Procession (Hae Saloong Luang), held annually to honor the Phra Kaew Don Tao Buddha image in Lampang, will be held today (April 12). It has been organized by Lampang Municipality and the Kelang Nakhon Heritages Promotion Association to celebrate the Thai traditional New Year festival from April 9-14. This year’s grand procession will start at Wat Pratu Ton Pueng, and then pass Tama-o Road and turn right to Boonyawart Road, to connect to the Clock Tower and pass along Thipchang and Wianglakorn Roads to end at the Kelang Nakhorn Public Park. The procession will stop regularly to allow people to decorate the image with som poi and kamin-scented water until it stops at the Wang River for more bathing of a Phra Kaew Don Tao Buddha image. The Great Silver Bowl is of exceptional size (49 cm x 89 cm wide, and 2,533 baht in weight) and of particularly fine workmanship, featuring illustrations of the Buddhist legendary six heavens. This parade features the most revered and respected Buddha image, known as Phra Kaew Morakot, or the Emerald Buddha Image, together with four other important Buddha images from four parts of Lampang. Throwing water on the images is said to bring good luck. Apart from that there will be some 20 working agencies taking part in the Songkran procession. During the festival and celebrations, there will be local food contests, the Man of the Sloong Luang model contest and Miss Songkran beauty contest and a wide variety of shows and entertainment by famous artists and stars. Mae Hong Song Governor Supot Loawansiri has indicated that the border Rak Thai village, Tambon Jampae, Muang District, Mae Hong Song Province, is regarded as a transit route for drugs into Thailand. It was known that some drug traffickers were living in the village, but they have now fled to Burma. The governor has requested the 17th Infantry Unit, Special Task Force to patrol along the border and stop drug traffickers coming into the Mae Hong Song area. The governor also spoke about offering Thai nationality to Chinese Haw immigrants who have settled in Rak Thai village who have helped the province keep an eye on drug trafficking. Others who do not assist, but instead try to persuade Burmese to come and settle down in the Rak Thai village, will definitely lose their chances to achieve Thai citizenship. The project of Chiang Mai - Lamphun Twin City is being developed to produce growth and business and tourism prospects in the upper north. Thawatch Satheanam, the governor of Lamphun, presided over the conference on the Twin City development project between Chiang Mai and Lamphun provinces at Lamphun city hall. The government has already proposed a policy to develop this by using the two cities’ ancient heritage, develop town planning and develop transportation by plane and make the cities centers for cargo transfers. The project for public utilities includes building two way-railways lines from Chiang Mai to Lamphun, developing the road going alongside the railways and building an overpass at the Northern Region Industrial Estate intersection. Part of the project includes education to establish information technology and information communication technology. The Communication Institute of Chiang Mai University is also planning to set up in Lamphun. Tourism would benefit by developing the ancient city moats of Chiang Mai and Lamphun, Wiang Kum Kam (the underground empire), Pa Sang (local woven cloth center), and national parks such as Khun Tan and Mae Ping National Park. Lamphun will present this project to the government to ask for support. Thick smoke from forest fires ravaging the northern province of Mae Hong Son on April 5 forced Thai Airways to cancel two of its Chiang Mai-Mae Hong Son flights. Mae Hong Son Provincial Governor Suphot Laowansiri called on farmers across the province to refrain from setting light to forested areas, saying it caused immense damage to the province’s economy. He conceded that it was sometimes necessary to burn fields to prepare the ground for new crops, but that during the dry season such fires could easily get out of control. In an effort to reduce traffic accidents, the Public Relief Operations and Disaster Prevention Department has begun teaching safe driving courses in the region. The Public Relief Operations and Disaster Prevention Department has begun teaching safe driving courses, hoping to reduce traffic accidents. 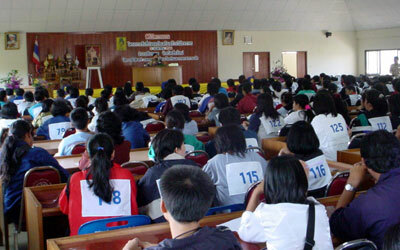 Shown here, the first group of students concentrate on their lesson. Around 140 people turned up for the first training course, held on April 3 at San Sai District Office. Kosin Kedthong, the director-general of Public Relief Operations and Disaster Prevention Department presided over this first in a series of safe driving courses. The Department in Chiang Mai, along with the Chiang Mai Provincial Land Transports Office, San Sai District Office and the Motorcycle Shop Owners Association held the training course. The main thrust of the training course was to cover traffic rules, regulations and how to drive carefully. It is hoped that after training, the trainees would in turn be able to transfer their knowledge to other people. If nothing else, the Public Relief Operations and Disaster Prevention Department expected that this project course would give people awareness on vehicle safely and reduce accidents. With even more luck, initiatives such as this might even get motorcyclists to wear helmets! Chiang Mai Provincial Electricity Authority has issued a warning to be careful during windstorms this summer. The authority says the general public should be particularly alert during April, as at the start of April each year, windstorms occur which damage the electricity supply system and public properties like electricity poles, lines and streetlights. To avoid accidents, people should carefully check and repair any kind of electrical equipment installed outside their buildings and cut off tree branches which are close to power lines. In addition, should windstorm damage happen, consumers affected should immediately turn off the main switch and inform the provincial electricity authority concerned as soon as possible. If electrical property is damaged in a way which can cause danger, the authority should be informed by calling 1129 or 053 241 226 twenty-four hours a day. A tropical storm hit Denchai District, Phrae. More than thirty houses, temples and some agricultural and farming land and products were damaged. Houses and school buildings lost their roofs from the strong wind that preceded the storm. Many villages in Saiyoi Sub-district, Denchai District were also heavily damaged by the storm and further damage was done by heavy rainfall that lasted all night on March 30. The storm also destroyed ten fishponds, three pig farms and a rice mill. Flooding resulted in more than four hundred rai of soybean fields being inundated by the floodwaters. Muak Thungngen, a villager of Ban Pak Pan said many trees were uprooted and the storm also damaged 15 rai of his soybean fields. Doi Saket District is celebrating their 100th anniversary, and celebrations will be held April 15-17 at Bua Phra Chao Luang Lake in Tambon Choeng Doi, Chiang Mai. Surapol Panasarnpol, Doi Saket district chief, held a press conference to announce the festivities planned for the district’s 100th anniversary celebration this coming week. On the first day of the Doi Saket ceremony 109 monks will tie sai sin (a protective thread for preventing evil influences) to every house in the village. Doi Saket District was established in 1902 from Tambon Nam Phrae, when it changed its name to Doi Saket District. The local monks, district and administrative organizations and the Doi Saket Club, the village headmen, the Seniors Club of Doi Saket, and Women Development Club of Doi Saket are jointly holding the 100 years anniversary celebration. On the second day and the last days there will be traditional Thai folksong concerts and light and sound shows. One of the more interesting displays at this fair is the biggest lotus in the world (to be approved by Guinness Book Records). The giant lotus will be located right in the middle of the Bua Phra Chao Luang Lake. Organizers hope to develop the Bua Phra Chao Luang Lake area into an important tourist attraction for Chiang Mai and help preserve traditional Lanna culture. The director of the Environmental Office, Region 1, Aphiwat Kunarak, is prepared to propose and impose environmental laws to help control air quality in Chiang Mai City. He said that in every hot season, air pollution seems to be a serious problem in the Chiang Mai and Lamphun provincial areas, particularly produced by burning waste problem since it creates oxides which are a danger to health. The director said that an example of the ongoing campaign to improve air quality is the Sunday Bicycle Club which will begin on Charoen Prathet Road, as there are several schools such as Regina Coele College, Montfort College and Sacred Heart College which are located in that area. The Environment Office has received numerous complaints from residents about polluted air and are looking for some solutions. “After receiving many complaints, we collect all information to offer some sustainable solutions to the provincial governor Pisit Khetphasook. There will be an announcement of martial law, if necessary,” said the director. Director Aphiwat believes that enforcement of the law would not destroy Chiang Mai’s tourism image, as many people are concerned. A good example, he said, is Phuket, since it has been a Pollution and Environmental Control Zone for almost eight years, and it remains a most attractive province to tourists. However, there must be emergency discussions to consider whether or not martial law should be imposed, he added. He also admitted that the air pollution levels in Chiang Mai and Lamphun areas are currently not serious but that everyone should take very good care of Chiang Mai’s air quality before it is too late. Doi Tao District, Chiang Mai is preparing to establish 42 drug-free villages to combat the drug problem and are erecting a “Power of the Land to Combat Drug Problems” Center to honor HM the Queen on the occasion of her 72nd birthday celebration on August 12 this year. Adul Songchaikul, Doi Tao district chief, stated that they have been very successful in their war against drugs, with 640 drug dealers and addicts entering rehabilitation camps. The camps provided for the drug dealers and addicts were built during February - March. Participants have come from all 42 villages of the six tambons and the district chief is convinced that Doi Tao will be a drug-free zone by the end of the 3 month campaign period. The government officers and local administrative offices have supported this project by making 758,400 baht available from funds. The participants’ wives and families also took part in this program supplying food and daily necessities. 1,600 forest fires have occurred this year, damaging over 9,000 rai of land. Pisarn Wasuwanich, the director of the Forest Conservation Administration Office 16 released the details. The Forest Fire Operation Center has launched a fire prevention campaign aimed at the general public, as most of the forest fires are caused by human beings. Director Pisarn has also released 150 forest firemen for training in helicopter firefighting to hopefully produce an early warning and aerial extinguishing service. The Forest Conservation Administration Office director hopes that there will be fewer forest fires than last year because of the earlier than expected rain. However, the Northern Meteorological Center reported that during this period, the westerly winds still prevail over upper Thailand, which will decrease the rain in this region. With the advent of westerly and southeasterly winds that will lie across northeastern and eastern Thailand, widely scattered thundershowers with gusting winds in some areas are likely during the afternoon to evening. Benji Straus, a 32-year-old American, was arrested on the charge of possession and selling heroin. Police from Muang District Police Station, led by Pol. Maj. Gen. Narich Sorndith, told Chiangmai Mail that they arrested the American man who was allegedly selling heroin at the Ratchadanont dormitory on Moonmuang Road, Chiang Mai. Following a tip-off, a team of undercover police pretended to buy 3 small packets of heroin and then the arrested the seller. Police also found 20 packets of heroin in his possession and one of hashish hidden in his clothes. The police information came after they had arrested Supanrat Suebjaktik, who had bought some heroin from Benji Straus. Strauss confessed that before being arrested in Chiang Mai, he had stayed in Phuket and been investigated by Phuket police. To escape the heat, he had come to stay in Chiang Mai, where he sold heroin to both Thais and foreigners. He has an antique shop, which mainly sells Buddha images, in the United States. He went through Thailand to buy ancient Buddha images and send these to be sold at his own shop in the United States. After his arrest, police raided his rented home in Tambon Pa Tan and confiscated 12,500 baht in cash, a television, a video game, and a bank account book, credit card and many ancient Buddha images. The Tourism Authority of Thailand and Thai Airways International have been ordered to stop the promotion of tourism to Thailand from the high-risk countries China, Hong Kong, Taiwan, Singapore and Vietnam. The Tourism and Sports Minister, Sontaya Khunpluem, said the number of tourists were expected to fall by 10 percent because of the war in Iraq and the Severe Acute Respiratory Syndrome (SARS) virus flu spreading out in some Asian countries. Promotion of inbound travel to Thailand had to stop from affected countries because of SARS. Plans to organize a road show in China this month have been postponed and the TAT has changed the focus to Japan and South Korea instead. The TAT also held an urgent meeting for tour operators and airlines on April 2 to encourage them to promote domestic tourism until the SARS epidemic is finished. Despite all the problems, tourism officials are still confident that the visitor target for this year would be 11.4 million as per the original and promotional plan. A Chinese man was arrested by Chiang Mai police at the Waroros Market this week for illegally selling medicine reputedly for erectile dysfunction (ED). Ms. Raweewan Preedisanit, the deputy secretary of the Food and Drug Administration, together with undercover police from the Chiang Mai Muang Police Station charged Wang Woo Xian, a 28-year-old Chinese man after they had purchased the fake patent medicine from him at his stall at the Waroros Market in Muang District, Chiang Mai. According to the police investigation, he was selling medicine claiming that it would treat sexual problems. The tablets were manufactured in China. Police confiscated 1,500 Viagra copy tablets. Wang was charged with selling drugs without the correct license. Ms. Raweewan stated that analysis of the fake drugs showed that they were dangerous to anyone who might have allergies, and the pills were not of a suitable standard for human consumption. A 52-year-old woman and her 26-year-old daughter last week jumped out of a high-rise condominium building in downtown Lampang. The mother died immediately, while the younger woman died on the way to hospital. Police were alerted to the situation after the Khe Lang 191 radio center was informed that the two people had jumped from the 3rd floor of Park View Condotel Condominium on Wangkhwa Road, Tambon Sobtui in Muang District. Rawesak Ungsirimonkol, a Park View Condotel employee, said that after he came back from lunch, he found the dead body of Mrs. Intira Limsintaropas behind condominium building with Miss Aunchana Limsintaropas, her daughter obviously very seriously injured. Police Lt Pana Saithong of Muang District police station is leading the investigation. According to police sources, the mother worked as a private financier and the daughter worked for Thammasart University, Lampang Campus. The police also found 10 bank account books with the list of her debtors. The motivation for their suicide is still not known and it has been reported that neither of them had any problems which might explain the double tragedy. Last year’s successful White Dormitory Project, one element of the war on drugs, will be repeated again beginning May 1. The Chiang Mai Social Development and Welfare Office and the Ministry of Social Development and Human Security says the latest initiative will continue from last year’s Dormitory Order Project. The project seeks the cooperation of the dormitory owners’ network to keep a close eye on the students who stay with them to ensure they are not selling, trading or taking drugs. The project provides three steps towards drug suppression. The first is to arrange a seminar for the dormitory owners’ network in five private university dormitories in San Sai Mae Ping, Phu Ping, Chang Puak and Muang areas. Next, the dormitories are checked by five teams of inspectors. The final step is to use the students who stay in the dormitories as “spies” to watch for drugs and drug-related problems in their residences. A serious legislation - or just a wet piece of paper? Sale of water pistols and water cannons is prohibited during the Songkran Festival, says the Consumer Protection Committee led by Deputy Prime Minister Korn Dabbarangsri, to avoid the danger from these aggressive items. These kinds of toys can inflict injury to many parts of the body and severely damage the eyes. Sellers are warned not to sell any kind of water gun or risk arrest and heavy fines. To protect consumers, the committee has invoked section 36 of the 1979 Consumer Protection Code by temporarily prohibiting the sale of water guns during this water festival, until the goods are approved as being safe. Those in violation of this order face a maximum of 6 months imprisonment and / or a maximum fine of 50,000 baht. Those in contravention of this act who are manufacturers or importers can face imprisonment of up to 5 years and a 500,000 baht fine.